WASHINGTON — Ivanka Trump is officially joining her father’s administration as an unpaid employee, after her plans to serve in a more informal capacity were questioned by ethics experts. Trump had said she’d voluntarily follow such provisions. 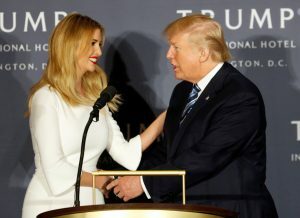 Fred Wertheimer, president of the government watchdog group Democracy 21 and a co-writer of the letter to McGahn, said he commended Ivanka Trump for formalizing her status. “Democracy 21 praises Ms. Trump for her decision, which recognizes that it would have been wrong for her to function as a White House employee and not be subject to the same rules that apply to other White House employees,” he said in a statement. Ivanka Trump’s attorney Jamie Gorelick said she will file the financial disclosures required of federal employees and will be bound by official ethics rules. “Ivanka’s decision reflects both her commitment to compliance with federal ethics standards and her openness to opposing points of view,” Gorelick said.